Home Lifestyle Reduce Sun Spots on Skin Using Natural Remedies! Sun spots on skin can sometimes be cute, but sometimes, we just hate them. If you want to learn how to reduce or remove them naturally, try using these remedies. The appearance of spots on the skin is usually considered an aesthetic problem. Fortunately, there are some remedies of natural origin that help to reduce them without using aggressive methods. The appearance of spots on the skin or hyperpigmentation is often a common aesthetic problem. It often appears as a consequence of age, but also by exposure to the sun, the consumption of some medications and certain diseases. 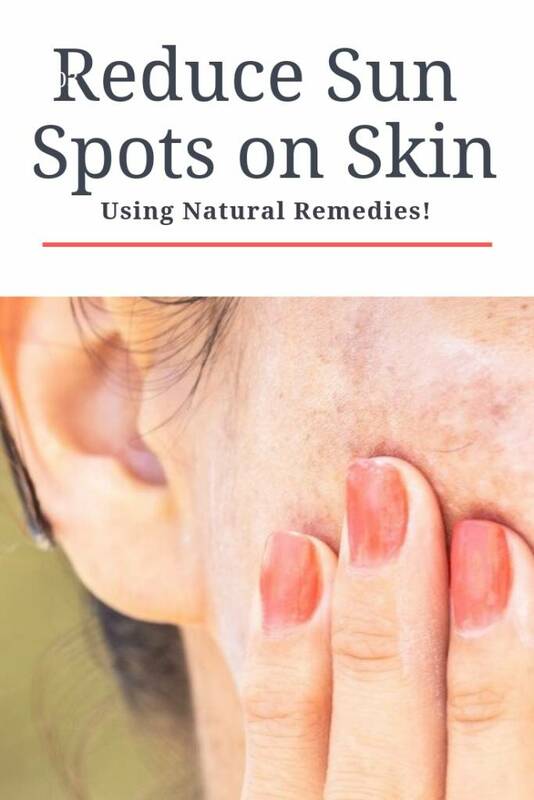 Do you want to learn how to make remedies to reduce the spots? Currently there is a wide variety of treatments and procedures that help clear up the skin when this problem develops. However, many of these methods are aggressive or expensive. Fortunately, there are natural remedies that give good results when they are used frequently. Do not stop trying them! The remedies to attenuate skin blemishes are natural formulas that have been traditionally shared. Although many of its effects are based on anecdotal data, some studies suggest that its ingredients may have positive effects against skin pigmentation. Do you dare to try them? The anti-stain effect of vinegar owes its effects to acetic acid, which restructures the skin barrier. One of the best remedies to attenuate skin spots naturally is apple cider vinegar. Thanks to its content of acetic acid, its topical application minimizes the darkening that forms in several areas of the skin. How to use apple cider vinegar for sun spots on skin? To start, combine equal parts of apple cider vinegar and water. Subsequently, apply it on the spots and let it act for 5 minutes. To finish, rinse with warm water. Use the remedy twice, daily, for the best outcome. The extract you can obtain from red onion is part of many products to lighten skin blemishes and scars. According to research, dry skin of this ingredient can minimize pigmentation. How to use red onion for sun spots on skin removal? The best way to take advantage of this ingredient is to use the creams that contain its extracts. Now, optionally you can use their dried peels for a natural remedy. Simply let the husks marinate in olive or coconut oil and use the product to treat the affected areas. Apply it daily until you notice an improvement. Aloe Vera has interesting benefits on skin health, providing greater hydration. In addition to being one of the best natural ingredients to rehydrate the dermis, Aloe Vera stands out among the list of remedies to attenuate the spots. Thanks to its content of aloin, its regular application decreases the excess of pigmentation in certain areas. Aloe Vera offers further benefits for the skin and can be quite useful for many face imperfections. How to use aloe Vera for sun spots on skin? First, you will need extract the gel thoroughly from an Aloe Vera leaf. Next, rub it over the spots before going to bed. Let it work without rinsing until the next morning. Repeat the treatment every day until the desired rinse is achieved. Due to its high concentration of antioxidant compounds, black tea is an excellent ally to take care of the skin. Its external use helps to block the negative effects of free radicals and, in turn, reduces the appearance of dark spots. How to use black tea to reduce sun spots on skin? First, add a tablespoon of black tea in a cup of boiling water. Next, let it stand for two hours and strain it. When you’re ready, dip a piece of cotton into the liquid and rub it over the spots. Repeat its use twice a day, minimum for six weeks. Its powerful antioxidant effect makes the tomato an ideal food to combat stains on the skin. A natural paste made with tomato can be very useful to care for the skin. Its high lycopene content provides a protective effect against the damage caused by free radicals and the sun. In addition, it tones the tissues and prevents the appearance of premature wrinkles. How to use tomato for spots on skin? The tomato benefits for the skin can be exploited by direct consumption, preferably raw or combined with olive oil. Now, it can also be used as a mask, finely chopping the vegetable. Apply on the problem areas of the skin and let it act 20 minutes. After this time, rinse with warm water and dry gently. Repeat its use every day, minimum for 4 weeks. If you still notice spots, prolong the treatment. It considers that the remedies to attenuate the spots are not miraculous and take a little in giving good results. If you want to know other options to combat this problem, consult the dermatologist. Also, ask for professional attention if you think the spots are associated with an underlying medical condition or medication. Don’t forget to SHARE how to remove sun spots on skin with your friends and all family members on your social networks!